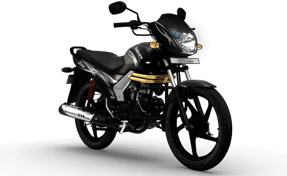 Mahindra Two Wheelers Limited (MTWL) was established in 2008 after the parent company Mahindra & Mahindra Limited acquired select assets of Kinetic Engineering. Headquartered in Pune, Maharashtra, it is a group venture owned by M&M and is known for manufacturing scooters and motorcycles. For the development of its scooter line-up, MTWL partnered with Taiwan based Sanyang Industry Company (SYM) and Italy-based ‘Engines Engineering’ which provides research and product design based support. Mahindra Two Wheelers launched one of its crucial models in the 110cc bike segment, Centuro in July 2013 followed by its game-changing model, Mojo in 2015. Mahindra Centuro comes powered by a 106.7cc single-cylinder, air-cooled, MCi-5 engine that puts out 8.4bhp and 8.5Nm of torque. The commuter motorcycle's design elements include a golden twin bar that wraps around its fuel-tank, multi-colored decals and a digital dashboard. The bike features a circular dial which partly displays its digital speedometer and rest of the dial house an analog Tachometer. There are other two LCDs also which comes with service reminder and distance to empty feature. The bike has a digital odometer, 2-trip meter, and fuel gauge. This instrument console comes with a unique white backlit which looks best at night. Mahindra Centuro has a mono cylinder, 4-stroke 106cc engine which produces a peak power of 8.5 bhp at 7500 rpm. This air-cooled engine generates a maximum torque output of 8.5 nm which is accessible at 5500 rpm. Centuro also has a four-speed gearbox with all gears up-shift pattern. Mahindra Centuro offers you some under seat storage space. Apart from front leg guard and rear guard, this bike becomes India’s first bike to offer safety features like Anti-theft system with an inbuilt engine immobilizer and guide lamps which illuminate to show you path at night even after you go away. Mahindra Centuro has a wide seat which confirms you optimum under-thigh support with proper back support. Mahindra Centuro has regular grab rail at the back which makes it look proportionate and complements the rear styling which has a wide fender with clear lens indicators. The tail lamp is adjusted well in the rear cowl just above its fender. Mahindra Centuro has high ground clearance which is 173 mm helps to turn this bike around corners and safely you can go pass most of the obstructions on roads Apart from this, the bike has a cool key remote with a LED which helps you to look for ignition switch even in dark. Mahindra Centuro has a wheelbase of 1265 mm which adds to the stability and that holds this bike well at high speeds. It has a simple and full-size front cowl and tinted. Mahindra Centuro has a combined analog-digital instrument console with all essential LED indicators in it. Mahindra Centuro has an anti-theft alarm system with engine immobilizer. It has an MCi-5 intelligent engine with find me lamps. This bike has a cool key remote with a LED which helps you to look for ignition switch even in dark Centuro has a digital dashboard with service reminder and remote flip key as well. Mahindra Centuro has styling and tubeless tire on the exterior as well which are loved by the Indian two-wheeler riders. Various Discounts such as membership of a recognized automotive association and another facility that we approved by IRDA. Quick Policy, as with the emergence of new technology and faster banking facilities, a digitally signed policy is nowadays issued immediately to the policyholder.